If you’re looking for a way to remember your deceased cat or dog, or want to show off your love for your current furry friend? Get a decorative pet tag with your pet’s name or nickname. Pet-Tags.com’s glitzy sparkling bling tags, fashion tags and glitter tags are great if you want a bit of sparkle. 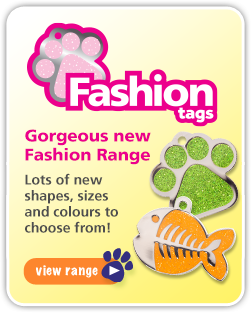 The colourful designer tags are fun and perfect for a charm bracelet or pendant. The brass and silver stainless tags are also a great option if you’re looking for something more simplistic and sleek. Wear your pet’s tag on a charm bracelet or as a pendant. It’s also a great decorative item for your keychain! Pet tags also make a nice decorative zipper pull for clothing or a backpack. It’s another fun way to show off your love for your dog or cat. You can also use your pet’s tag as a easy identifier for your pet’s “diaper bag” that goes with her to and from doggy daycare or the doggy hotel. 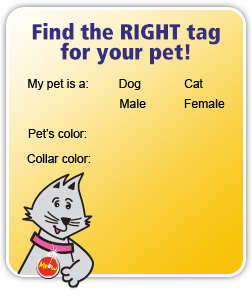 And don’t forget to grab a tag for your other pet! 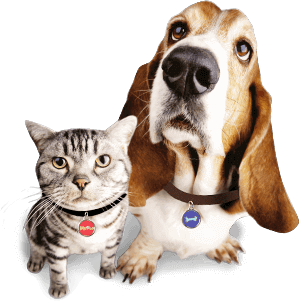 Ferrets, rabbits, pet potbellied pigs, goats – they can all benefit from a pet tag for their collar or harness so they’ll be sure to find their way home if they accidentally get lost!